Next time I get it set up I will snap a picture. This might not be until 24-Nov because my plan for the 16-Nov target date has changed now since I've run into unexpected complications with the focus (described below). Just today I found that the "shortened" version of the adapter described at the end of my last post that omits the camera-adapter's eyepiece tube just won't work as shown (in the second set of pictures from my last post). It turns out the focal point of the telescope is just a bit closer than the camera sensor, resulting in a terribly blurred image that is impossible to bring into focus. However I can get focus if I attach the 2x Barlow lens to the camera-adapter. While the Barlow has the added benefit of doubling the magnification, the connection to the star diagonal (that's the "L" shaped thing the camera is connected to in the pictures in my previous post and is what usually holds the eyepiece when using the telescope normally) is even more awkward than the camera-mount's eyepiece holder. Further research has indicated I would be better off removing the star diagonal entirely and attaching the camera-adapter directly to the telescope's focusing tube. This is not without it's drawbacks, as without the star diagonal the image in the viewfinder is upside down (which makes directional aiming very confusing because up is down and left is right). It is also more awkward to look through the viewfinder if the telescope is pointed almost straight up. Fortunately my camera includes Canon software that allows me to USB tether the camera to my laptop so I can see the image there - and also use the connection as a cable shutter release (a very good thing!). The problem is (there's always bad with the good ) I have never used the software so I still need to learn how it works. Telescopic pics will have to wait for the flybys at the end of the month while I test the focus on new adapter configurations and get accustomed to aiming with an inverted image. I'm learning as I go, so I hope some initial missteps will be forgiven as I figure out the different ways of using the telescope's camera-adapter. For the 16-November flyby, weather permitting, I will use only the camera on a tripod to get a couple of long-exposure (20-second shutter) images as it flies above the constellation Gemini and through Cancer. These pictures will disclose the accuracy (or lack thereof) of the plotted path shown in Heavens Above's sky-chart. This will be important to know if I am to rely on them for precision aiming. 16-Nov: long exposure pictures with the camera's 70mm lens. I'll also try to see the thing through my telescope, but I won't hook the camera up to it. 24-Nov and 25-Nov: Try out the aiming and focus with the camera-adapter and telescope sans star diagonal. Also working with camera tethering software. 26-Nov, 27-Nov, and 29-Nov: Try to get photos or video footage of ISS through the telescope. All plans are weather permitting, of course. I'd like to practice the aiming and such before the 24th, but I want to use the Moon as a target and it's night-time visibility won't be where I need it until then. Walnut Creek, California. Anything more specific than that I can't accommodate as I have an aversion to releasing personally identifiable information on the Internet (I don't even use FaceBook ). hoi.polloi » November 13th, 2017, 4:03 pm wrote: Do you mind also please (re)posting the web site you use for tracking time and location of the ISS? I use Heavens Above for everything because it is so easy. Just select your location from the map and it lists all upcoming ISS flybys in local time. Click on an individual pass and it shows the star chart with the path plotted on it. Click anywhere on the star chart and it will show a magnified view of centered on that spot. The magnified view is very useful because it shows more detail and is also less distorted than the sky chart (which is a projection of a half sphere onto a 2D plane). I also use a software program called Stellarium (great software that everyone should get - its free) to check individual flybys and get a feel for exactly how it will track across the sky. NotRappaport wrote: I use Heavens Above for everything because it is so easy. Just select your location from the map and it lists all upcoming ISS flybys in local time. You see, back then I used Nasa's "SPOT THE STATION ISS alert service" and - as you can read in my old above-linked post - there were a number of strange / absurd issues regarding some severe inconsistencies between the SPOT THE STATION alerts and the HEAVENS ABOVE alerts. I spent a little time this morning comparing the two - and it now appears that they've somewhat gotten their act together (at least as far as most CURRENT alert data is concerned). However, inconsistencies remain. Did I dream that I saw these passes with my own eyes? Am I a "Mandela effect" victim? Moreover, how can HEAVENS ABOVE possibly, after all these years, fail to list important "ISS passes" (such as the one due tomorrow, Nov 15, 2017)? 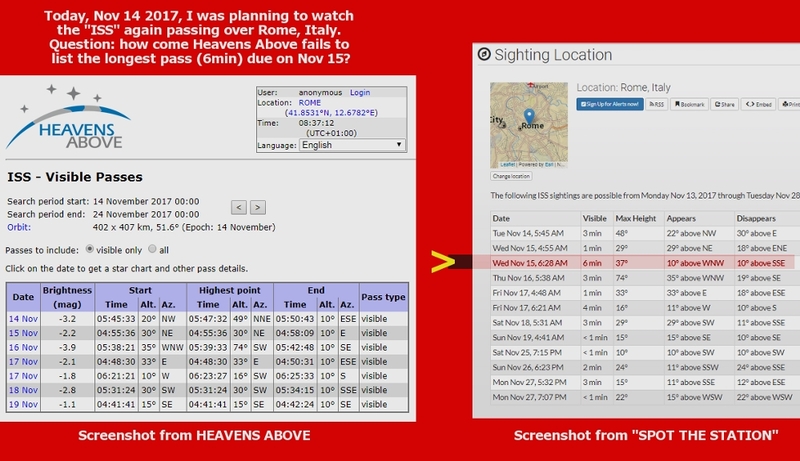 In any event, dear NotRap, I would strongly advise you to not rely solely on the HEAVENS ABOVE alert service - since, as you can see in my above sample, it will at times - quite inexplicably - fail to list some "ISS passes" (in this case a very 'good' one, lasting for all of 6 minutes!...). it will at times - quite inexplicably - fail to list some "ISS passes"
Check the "passes to include:" radio button to "all" and that will solve your dilemma. 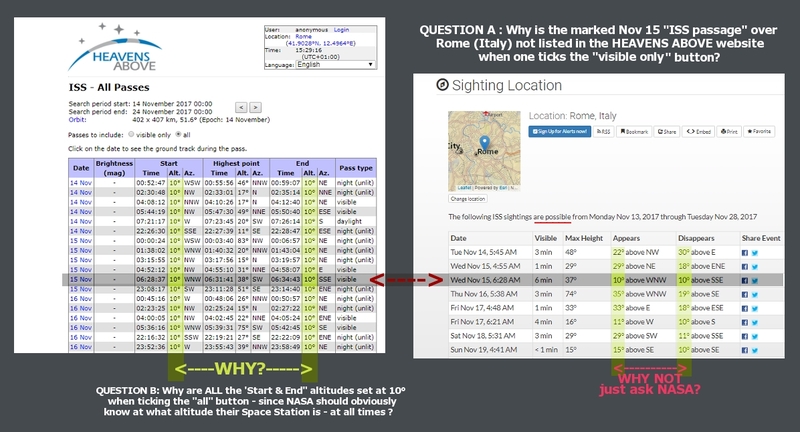 SInce that 6-minutes-long Nov 15 "ISS passage" (at 6:28 AM) over Rome is listed as "visible" in the HEAVENS ABOVE database, why then would it NOT be listed as one ticks the "visible only" button? To be sure, the sun only rises at about 7:00 am tomorrow, so that passage (reaching as high as 38°in the sky) should in fact be visible. Anyways, I'll just hope for clear skies tomorrow morning and see if I can spot the Thing from my garden. I therefore have documented proof of the fact that the "ISS" passed over Rome on the two above dates and times - which is quite a relief, if you ask me! So I certainly did not dream up nor hallucinate these two 2014 passages. Edit update: I have just sent an e-mail to Chris Peat of HEAVENS ABOVE, asking him to kindly elucidate this matter. simonshack » November 14th, 2017, 4:22 am wrote: Did I dream that I saw these passes with my own eyes? Am I a "Mandela effect" victim? The important thing to note about the data on Heavens Above is that it is extrapolated from the current "Epoch", which is shown in detail on the "orbit" link. It is updated each day. The closer the pass is to the Epoch date, the more accurate the prediction is, but as you move days, weeks, or months away from that date it becomes very inaccurate. On your image it shows the Epoch is November 14 (2017), yet the pass details are for more than 3 years prior. Unfortunately Heavens Above does not archive the older epoch data for calculating old passes, but always calculates every pass with the current epoch data. simonshack » November 14th, 2017, 4:22 am wrote: Moreover, how can HEAVENS ABOVE possibly, after all these years, fail to list important "ISS passes" (such as the one due tomorrow, Nov 15, 2017)? It seems the sun is not far enough below the horizon for Heavens Above to include it in the "visible" passes. See the Explanatory Notes page where it states: "All the predictions assume that the sun has to be at least 6° below the horizon, otherwise the sky will still be too bright." "We have a cut-off of -6° sun altitude for our predictions, so that satellite passes are only predicted when the sky is reasonably dark. However, these bright satellites can sometimes be seen when the sun is higher, but this explains why they aren't in the list." 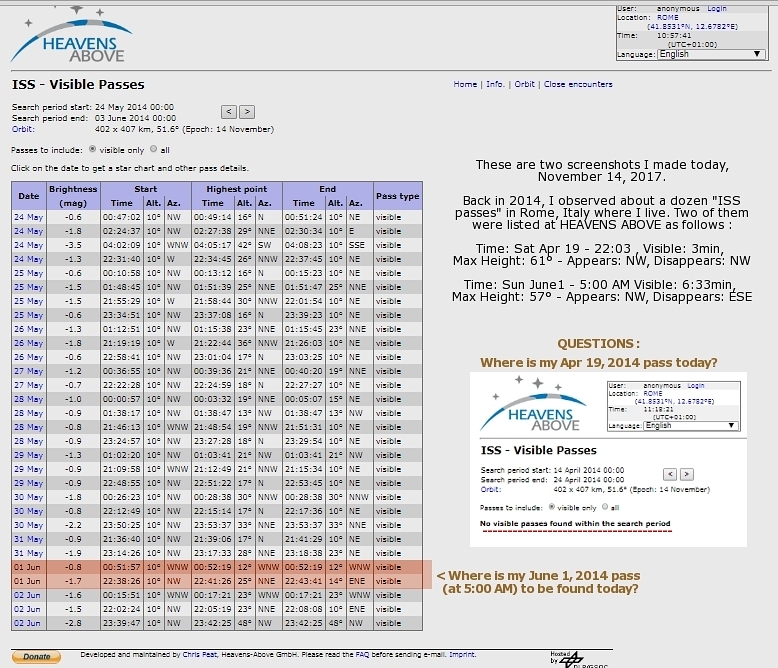 When you change the listings from "visible" to "all", click on the pass details and it shows the sun's distance below the horizon is less than 6 degrees for almost the entirety of the pass (save for the first instant when the ISS reaches 10 degrees). Its an interesting case where the pass is right on the cusp of the parameters that Heavens Above uses to determine whether a given pass will be listed as visible or not. NotRappaport wrote: Unfortunately Heavens Above does not archive the older epoch data for calculating old passes, but always calculates every pass with the current epoch data. Why on Earth would they do that, pray tell? It would be like a planetarium (such as https://neave.com/planetarium/) showing the positions of the planets (as you go back in time) as calculated with the current epoch, i.e. without accounting, say, for the precession of the equinoxes - which would be a completely useless tool for astronomers! So, are you telling me that there exists no database which keeps the historical record of the ISS passages? Good grief. I do hope you realize how ridiculous this would be. I would guess because its simpler to code that way (and uses less processing power compared to referencing and calculating position from a separate epoch for each day in the range of results) and it serves the function of helping people spot the ISS, which seems to be the main point of the site (and is all I'm using it for). simonshack » November 15th, 2017, 12:10 am wrote: So, are you telling me that there exists no database which keeps the historical record of the ISS passages? There's the epoch data, from which the passages are calculated. That data certainly exists and is maintained by the curator who's contact info is at bottom of the "ISS TRAJECTORY DATA" page, (and there's archive.org's copies of that page). Beyond that I don't know what sort of historical records database of passages you might have in mind. Since its visible at twilight over an area around 1000 kilometers wide 30 times per day (15 orbits x2 - morning and evening), that's a lot of individual locations/path data within each of the 10,950 (30x365) visibility windows that occur each year across the world. A set of 365 separate epoch dates per year is a lot more workable. NotRappaport wrote: Beyond that I don't know what sort of historical records database of passages you might have in mind. Simply the same sort of historical records (available on ANY astronomical planetarium worthy of its name) of each and everyone of our surrounding planets circling around us since thousands and thousands of years. What's your problem in understanding what I have in mind, NotRap? What has 'processing power' have to do with just keeping a fecking record / archive of past "ISS" passages? I'm not sure what you're upset about, Simon. I'm just pointing out the extra logistical issues when dealing with things whose epochs require daily updating. The epoch data for objects (planets, moons) you see in planetariums don't need such frequent updates. It seems to do what you want by using epoch data closer to the date being viewed, although I don't know what one could hope to glean from such minutiae. By the way, were you able to observe the passage this morning that Heaven's Above didn't list due to the sun being less than 6 degrees below the horizon? anonjedi2 » November 7th, 2017, 5:21 pm wrote: One question for you. Say that indeed you are able to capture this object in your viewfinder. What does it prove to you, other than "there is an object" ? Well, proving there is an object, and something about it's shape, is significant. anonjedi2 » November 7th, 2017, 5:21 pm wrote: Does it prove anything about the object's distance and size? Yes, it would prove distance (and therefore size due to it's angular diameter at that distance). Although I don't need a setup this complicated to prove only distance. All that would require is a regular camera that can take long (30 seconds or more) exposures. Put the camera on a tripod and aim it upward where the thing's predicted path will cross and start the exposure when its in-frame. Look at the picture afterwards and verify the path against the background stars (which you will be able to see with such a long exposure) was as predicted in the chart. The reason that would prove distance is because all the location/visibility/path information on Heavens Above is based on it being at that ~400 km distance. You can verify this by selecting any given flyby and then comparing the path for a location a few km away. If it weren't at that distance and were instead much closer, the path would be significantly different for locations only a few km apart. I don't see how spotting an object in the sky proves anything about that object's size and/or distance, unless you're just plugging values into a model. Are you claiming you know for a fact that the sun is 864,575.9 miles in diameter and 93 million miles away from Earth? How can you possibly prove such a thing? If the sun was 400 times smaller and 400 times closer to Earth, it would still appear as it does, the same size as the moon. How could you ever know the difference? NotRappaport » November 7th, 2017, 5:49 pm wrote: The reason that would prove distance is because all the location/visibility/path information on Heavens Above is based on it being at that ~400 km distance. You can verify this by selecting any given flyby and then comparing the path for a location a few km away. If it weren't at that distance and were instead much closer, the path would be significantly different for locations only a few km apart. The same way you can prove the Moon is hundreds of thousands of kilometers away, or that the planets are millions of kilometers away: by measuring the parallax angle and using trigonometry. It's the same case with the altitude of whatever the "ISS thing" is. By comparing the parallax between two locations we can easily determine it's distance. If it were only 30km above, the parallax would be very easily detectable (1.9 degrees) from locations only a kilometer apart. But you'd need to know the size (diameter) of Venus first, would you not? Or at least the distance between Earth and Venus? anonjedi2 » November 15th, 2017, 9:11 pm wrote: But you'd need to know the size (diameter) of Venus first, would you not? Or at least the distance between Earth and Venus? Nope. You only need to know how far apart your observation locations are from each other and the parallax angle that is observed when comparing the view from both locations. From that you can estimate the distance from Earth to Venus. Once you have that distance you can then estimate it's size based on it's angular diameter, and also estimate the distance from Earth to Sun. NotRappaport » November 13th, 2017, 9:28 pm wrote: 16-Nov: long exposure pictures with the camera's 70mm lens. I'll also try to see the thing through my telescope, but I won't hook the camera up to it. I looked out the window this morning and it was pouring rain. Its still raining now over an hour later. First really good rain we've had in months and it happens today! Now waiting for the next good pass, which is tomorrow morning (even earlier). After that the next one is the 26th (evening - yay). NotRappaport » 16 Nov 2017, 15:50 wrote: I looked out the window this morning and it was pouring rain. Its still raining now over an hour later. First really good rain we've had in months and it happens today! Still raining, or didn't you have time for some computer processing?